Until recently, if you were one of the millions of people with a refractive errorâ€“light rays not focusing precisely on the retinaâ€“eyeglasses and contact lenses were the only options for correcting vision. 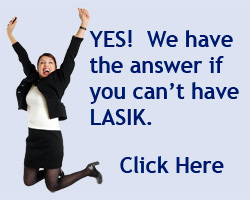 But with the arrival of refractive surgery, some people may have their vision corrected through surgery. Photorefractive keratectomy (PRK) is one of several refractive surgery procedures used by ophthalmologists to permanently change the shape of the cornea to improve the way it focuses light on the retina.